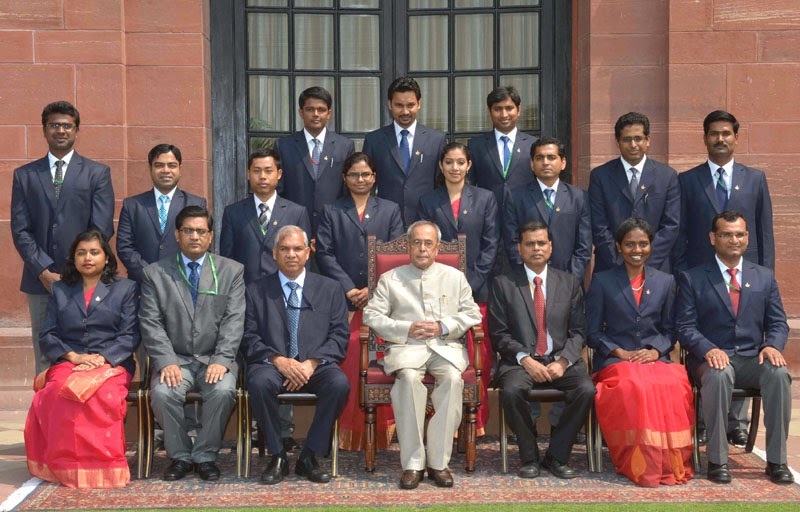 The President, Shri Pranab Mukherjee with the Probationers of the Indian Postal Service of 2014 Batch, at Rashtrapati Bhavan, in New Delhi on March 26, 2015. A group of probationers of Indian Postal Service of 2014 batch and the Indian P&T Accounts and Finance Service of 2013 and 2014 batches called on the President of India, Shri Pranab Mukherjee today (March 26, 2015) at Rashtrapati Bhavan. Speaking on the occasion, the President congratulated the probationers on having cleared one of the toughest competitive examinations i.e. the civil services, which speaks of their academic excellence. He stated that government service provides them an opportunity to serve the people of this great country. He advised the probationers that their job as public servants is to deliver service. They are an important part of the socio-economic transformation of the nation. He said that the Indian Postal system is one of the institutions that has helped bring the people across the length and breadth of the country together. Over the years, the Department has assumed its own character and ethos. The probationers of the Indian Postal Service and the Indian P&T Accounts and Finance Service are presently undergoing professional training at the Rafi Ahmed Kidwai National Academy, Ghaziabad and the National Institute of Communication Finance, Ghaziabad respectively. The President of India, Shri Pranab Mukherjee yesterday (March 25, 2015) received His Highness Sheikh Tamim bin Hamad Al-Thani, the Emir of the State of Qatar. He also hosted a banquet in his honour. The President said the rich experience of India’s globally reputed companies in executing infrastructure projects of the highest standard is at the disposal of its Qatari friends. India is confident they would be worthy partners in Qatar`s economic progress and would contribute meaningfully towards Qatar’s preparations for the 2022 FIFA World Cup. The President said India deeply values Qatar as a reliable source of energy. It is time that the two countries convert their commercial synergies into a deeper energy partnership through India-Qatar joint ventures in refineries and petrochemicals projects in India, as also through joint exploration in third countries. India invites investors and entrepreneurs from Qatar to look at India’s infrastructure sector and to join in the "Make in India” and “Digital India” initiatives. India’s 100 Smart Cities project is open for foreign participation. Foreign investment caps have been eased in construction, railways and defence sectors. India looks forward to new partnerships and collaborations in areas of common interest. A delegation of CPWD Wives Association led by Smt. Lata Garg calls on the Vice President, Shri Mohd. Hamid Ansari, in New Delhi on March 26, 2015. A delegation of `CPWD Officer`s Wives Association` led by its President Smt. 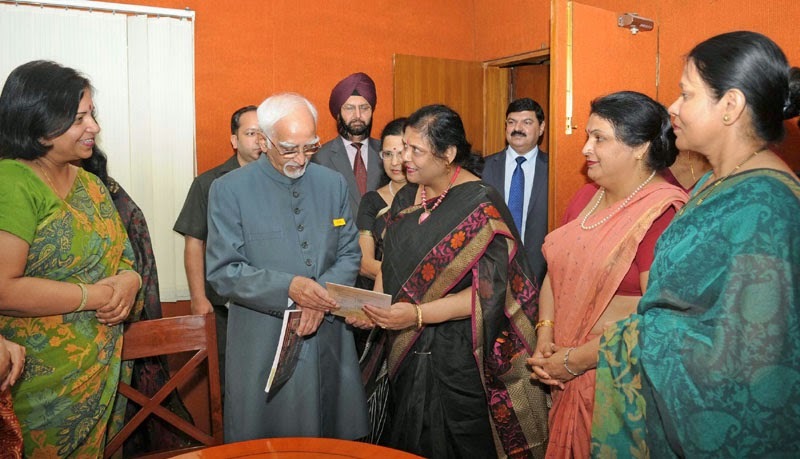 Lata Garg called on the Vice President of India Shri M. Hamid Ansari here today on the occasion of `CPWD Employees Welfare Month` and presented their Flag to the Vice President. The Vice President wished them good success in their relief and welfare efforts for needy personnel of CPWD. The month of March every year is celebrated as `CPWD Employees Welfare Month` and Flags are distributed to raise funds for welfare activities of the Association. CPWD Officer`s Wives Association is an organisation engaged in relief and welfare of needy personnel of CPWD, running of Bal Basera (Creche) at construction sites, vocational training and upliftment of needy women etc. The Vice President of India Shri M. Hamid Ansari has said that our higher education system continues to have limited research capacity. Low levels of funding and segregation of the country’s R&D institutions from universities and colleges have been responsible for the weak research capacity of Indian universities. It is disappointing that even the country’s top universities remain largely teaching-focused with limited research and doctoral education. 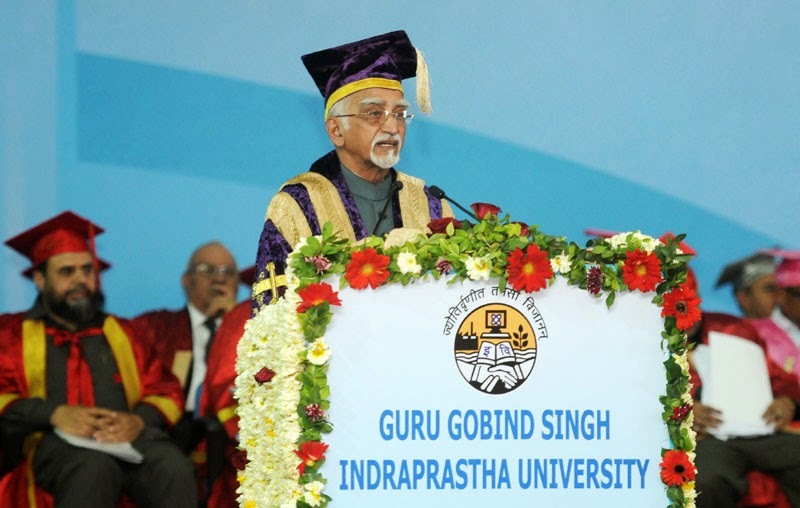 Addressing at the ‘10th Convocation of the Guru Gobind Singh Indraprastha University, New Delhi’ here today, he has said that this lack of research orientation, even in the best of the Indian institutions, is reflected in their standing in global rankings, most of which rely heavily on measurable indices of research performance. No Indian university figured amongst the top 200 universities in the Times Higher Education Rankings or the Academic Ranking of World Universities. He opined that to face up to the increasing challenges in the new world order, our science & technology landscape needs to undergo a paradigm shift. A competitive knowledge economy must be built on the pillars of: (i) an educational system that produces human resources which are employable and globally benchmarked; (ii) S&T pursued on an enormous scale to generate knowledge for long-term use and (iii) strategic translational research inspired by national needs and global opportunities. The Vice President said that in pursuance of these objectives, we will have to aim at quadrupling our R&D base, stimulate research where R&D productivity is relatively lower, provide challenges to institutions for global positioning including in intellectual property generation, establish new academies and institutions, build up large publicly funded and privately managed facilities to help researchers. Emphasis should also be given on strengthening linkages between universities, R&D institutions, science academies and industry. He said that our investment in research and related activities since independence has lead to creation of substantial capacity and capabilities in science and technology, evident in our Nuclear and Space programmes and in the Information Technology, Bio-technology and Nano-technology sectors etc. High quality basic research in physics, chemistry, biology, mathematics, computer science and science education is being undertaken in universities, and in islands of excellence like the TIFR, Indian Institute of Science, Jawahar Lal Nehru Centre for Advance Scientific Research, and some others. The Vice President said that Science, technology and innovation have emerged as major drivers of national development globally. As India aspires for faster, sustainable and inclusive growth, our research and development system will need to play a defining role in achieving these national goals. He congratulated the graduating students and their families and said that their achievements are a source of joy and pride to them, the University and the nation. They owe their success to their own hard work and commitment but they should also remain thankful to their parents and teachers for invaluable contributions in this success. They should also not forget their debt to society and the country and remain mindful of the millions of fellow citizens who are deprived and marginalized and need compassion and help. I leave them with a few words from Tagore for inspiration “I slept and dreamt that life was joy. I awoke and saw that life was service. I acted and behold, service was joy”. “Convocations are occasions to honour intellectual achievement and celebrate life in the academic world. They mark the graduation of students from the safe haven of a temple of learning to the realities and challenges of life outside it. Students leaving the portals of their alma mater today, to venture into the world beyond it, would value the instruction and counsel received here. It is nevertheless important to remember that pursuit of knowledge is a lifelong process and does not end with the acquisition of a university degree. The aim of education, as Herbert Spencer put it, is not only knowledge but also action. The foundation of every state, said the philosopher Diogenes a long time back, is the education of its youth. This truism is even more valid in the 21st century when the world is moving towards a knowledge economy in which the focus has shifted to the ability to produce and generate new knowledge, especially in frontier research and cutting edge technology. This is the challenge that beckons us as a nation today. It has to be addressed within the framework of our quest for a just and vibrant society. Our investment in research and related activities since independence has lead to creation of substantial capacity and capabilities in science and technology, evident in our Nuclear and Space programmes and in the Information Technology, Bio-technology and Nano-technology sectors etc. High quality basic research in physics, chemistry, biology, mathematics, computer science and science education is being undertaken in universities, and in islands of excellence like the TIFR, Indian Institute of Science, Jawahar Lal Nehru Centre for Advance Scientific Research, and some others. · Only 1% of the students enrolled in higher education are pursuing research in various areas. This reflects a lack of focus on research. · The full Time Equivalent R&D professionals in India have stagnated for long. We remain ranked ninth in the world. · India’s output in PhDs is relatively small. According to UGC in 2011-12, only around 17,600 PhDs were awarded, which is 0.1% of total enrollment. Science and engineering accounted for around 8000 PhDs which is much less compared to 30,000 and 25,000 approximately for China and the USA, respectively. · India’s share in world output of science papers in 2012 stood at around 3.6% compared to more than 14% for China. According to one estimate, we moved from fifteenth position in 2003 to seventh in the world in 2013, in terms of scientific publications. · Although there are some encouraging growth trends with respect to volume of scientific publications, India’s global competitiveness in terms of quality of scientific contributions and global impact need to improve significantly. · We were ranked fourteenth globally in terms of the number of citations. Our citation impact rose from about half to three quarters of the world average (of one) during the last decade. · While our contribution of highly cited papers, as a percentage of total output, has improved, it has remained stubbornly low, achieving by 2011, only about half of the 1% expected. · In the 2005 to 2012 period, published patent applications originating from India have oscillated between 4,000 and 7,000 per annum, maintaining an average over the period of around 5,900 per annum, which is around the same level as Australia and Great Britain. However, with a population of over 1.2 billion compared to 22 million for Australia and 62 million for Great Britain, this level can be considered particularly low. · Inventiveness in basic science, as indicated by creation of intellectual property, is low. India’s innovation system ranking varies between 50 and 60 among the nations. Domestic innovation has remained stable from 2005 to 2012 at around 29%. Nearly two thirds of all Indian patent applications in 2012 were from foreign concerns seeking protection for their innovations in the Indian market. Our higher education system continues to have limited research capacity. Low levels of funding and segregation of the country’s R&D institutions from universities and colleges have been responsible for the weak research capacity of Indian universities. It is disappointing that even the country’s top universities remain largely teaching-focused with limited research and doctoral education. This lack of research orientation, even in the best of the Indian institutions, is reflected in their standing in global rankings, most of which rely heavily on measurable indices of research performance. No Indian university figured amongst the top 200 universities in the Times Higher Education Rankings or the Academic Ranking of World Universities. To face up to the increasing challenges in the new world order, our science & technology landscape needs to undergo a paradigm shift. A competitive knowledge economy must be built on the pillars of: (i) an educational system that produces human resources which are employable and globally benchmarked; (ii) S&T pursued on an enormous scale to generate knowledge for long-term use and (iii) strategic translational research inspired by national needs and global opportunities. In pursuance of these objectives, we will have to aim at quadrupling our R&D base, stimulate research where R&D productivity is relatively lower, provide challenges to institutions for global positioning including in intellectual property generation, establish new academies and institutions, build up large publicly funded and privately managed facilities to help researchers. Emphasis should also be given on strengthening linkages between universities, R&D institutions, science academies and industry. The twelfth Plan document suggested some of the following correctives and targets in order to achieve these goals. · Evolve a new Science, Technology and Innovation policy to bring in more resources from both public and private sector for R&D for socially and strategically relevant projects and mainstream innovation-related activities. · Ensure Science & Technology becomes an integral component of the national development processes by strongly linking research resources with other stakeholders. · Increase the number of full-time researchers/scientists from the current level of 1.54 lakh to 2.50 lakh; the volume of publication outputs in basic research from a global share of 3 per cent to, say, 5 per cent; improve the global ranking from 9th to 6th by the end of the Twelfth Plan. · Focus on doubling the number of patents and increase the commercialization of patent portfolio to 5–6 per cent from a level of less than 2 per cent. · Increase R&D expenditure to 2 per cent of GDP and significantly enhance corporate sector R&D expenditure to at least 1 per cent of GDP by attracting investments and engaging the corporate sector in R&D through policy and reforms processes. · Provide more flexibility to the younger generation of scientists to pursue their ideas and greater mobility between industry, academia and R&D institutions; strengthen gender parity in R&D and nurture students towards pursuing science as a career. Science, technology and innovation have emerged as major drivers of national development globally. As India aspires for faster, sustainable and inclusive growth, our research and development system will need to play a defining role in achieving these national goals. The Prime Minister, Shri Narendra Modi, today called for an "uncompromising mission-mode approach" to stop further pollution of the River Ganga. Chairing the fifth meeting of the National Ganga River Basin Authority in New Delhi, the Prime Minister said the task of cleaning the Ganga was a challenging one, but had the potential to generate immense economical activity, and bring about a positive attitudinal change in the entire country. He said that it is "our responsibility for future generations" to save the River Ganga. He said the River Ganga was associated with "faith" and "devotion" among millions of Indians, and the task was to convert these positive sentiments, into a feeling of responsibility. He said the task at hand could not be accomplished without "Jan-Bhaagidaari" (people`s participation). A delegation meeting the Prime Minister, Shri Narendra Modi to discuss issues related to Jat Community, in New Delhi on March 26, 2015. A 70-member delegation from various states called on the Prime Minister, Shri Narendra Modi today, to discuss issues related to the Jat community, including the recent Supreme Court decision regarding reservation. The Prime Minister listened carefully to the issues raised by the delegation. He said the Government is studying the Supreme Court decision and will try to find a solution to the issue within the legal framework. The Prime Minister urged the delegation to take the lead in implementing the “Beti Bachao, Beti Padhao” Abhiyan. The Ministry of AYUSH is launching a new weekly programe on Doordarshan from March 28, 2015 at 6 PM. Biennial Election to the Council of States from Kerala. The Commission had issued Press Note No. ECI/PN/25/2015 dated 20th March, 2015, announcing biennial election to the Council of States from Kerala. The date of poll was fixed on 16th April, 2015. However, subsequently a request from a National political party was received for change of date of poll, as the MLAs of that party who are electors in this biennial election will be very busy with their party programme from 14th to 19th April, 2015, outside Kerala. Having considered this request the Commission has decided to re-schedule the date of poll for the said election from 16th April, 2015 to 20th April, 2015. Other stages of the election will remain unchanged and the Presidential notification calling the election will be issued on 30th March, 2015, as scheduled earlier. On the occasion of the 77th meeting of the General Council of National Cooperative Development Corporation today in New Delhi, Union Agriculture Minister Shri Radha Mohan Singh said that the Government is keen to usher modern techniques in agriculture sector. He emphasises that the Prime Minister attaches importance to revitalization of the agriculture sector through modernization of farming practices thereby increasing crop productivity without compromising on quality. Shri Singh said that the measures announced by the Government like Pradhan Mantri Krishi Sinchai Yogna to ensure more crop per drop are aimed at improving efficiency of farm activities and also increasing farm productivity. Shri Singh said that while increased productivity is an essential component of a vibrant agricultural sector, improved post harvest handling and processing is essential to ensure value addition, reduction in wastage and transporting good quality products to markets. He said that it is in this context that agricultural cooperatives have a very important role to play and it is expected that NCDC to fully support them. 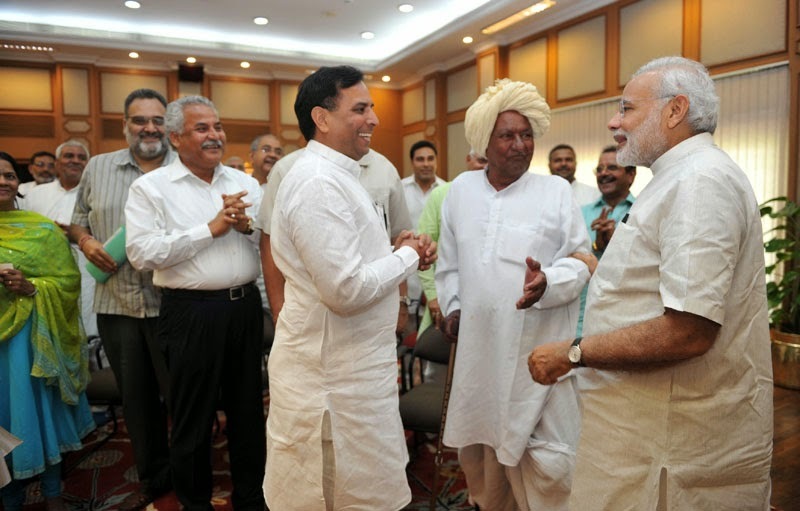 Shri Singh said that agriculture remains central to India’s economy. He said that the livelihood of a large number of farm families is linked to agriculture. He said that the country is a leading producer of several commodities – cereals, fruits, vegetables, milk, eggs and jute. Further, in a scenario of growing grain stock and increasing production of high value commodities, improving market linkage assumes great significance, he said. Shri Singh urged for participation and involvement of the cooperatives in the marketing and distribution of agricultural commodities. Shri Singh said that during the year, NCDC would continue to support and supplement Government efforts towards development of cooperatives in agriculture and allied sectors. The focus would be on consolidation of the existing infrastructure and units established by the cooperatives especially for value addition and processing of farmers’ produce, strengthening of forward and backward linkages for procurement and marketing. He spoke about strengthening of the existing monitoring systems and creating awareness about NCDC schemes / programmes by organizing workshops. With the view to putting in place an institutional mechanism to track stalled investment projects, both in the public and private sectors and to remove implementation bottlenecks in these projects on a fast-track basis, Shri Piyush Goyal, Union Minister of State ( IC) for Power, Coal , New & Renewable Energy has launched online Coal Projects Monitoring Portal (e-CPMP) for all large projects, both public and private in the Ministry of coal here today. Speaking on the occasion , Shri Goyal said that the new system will bring in more transparency and responsiveness in the Ministry. Shri Goyal expressed his confidence that each of 30 allottees will successfully mine each piece of coal that is expected from them. The Government will encourage everyone to do more mining so that each one of allottee will not only meet their targets but exceed their targets, Shri Goyal added. Shri Anil Swarup , Secretary Coal said that this marks a new beginning in making system transparent in the coal ministry. e-CPMP (Online Coal Project Monitoring Portal) has been developed for tracking projects that entail an investment related to coal. IT automates the entire tracking of projects in the context of the bottlenecks. This system has been designed in such a way that it will enhance the efficiency, bring transparency, boost the investor confidence, revive the investment cycle, eliminate the human interaction, and improve the communication between industries to Government (B2G), Government to Government (G2G), or vice versa (G2B). It automates the entire tracking of issues resolution mechanism from submission to commission on time. This would include submission of a new project, editing/updating the projects, reviewing the projects, submission of details relating to bottlenecks and the decisions taken to remove the implementation bottlenecks in the stalled coal related projects. It also includes preparation of Agenda that can be generated online and circulated with auto mailer to all the Nodal officers. System also provides various Graphical Analysis and Reporting functionalities. The system also provides general issues module through which agencies, states and coal administrator can discuss other issues apart from projects. Investors (Private Entrepreneur) can create their login credential with this platform and the same credential can be used to submit projects with issues. When any project with issues is being added by an Investors (Private Entrepreneur) to the e-CPMP, the portal shall automatically push the data to the respective agencies/Subsidiaries for their comment or action. Once the project is being endorsed by Nodal Officer of e-CPMP, Investors get the immediate response through automatic mailer and they can see the current status of concerned projects through this platform immediately after the subgroup meeting is over, if the decision being entered online. Telecom Regulatory Authority of India will be holding consumer outreach programme at Auditorium, National Institute of Health & Family Welfare, Baba Gangnath Marg, Munirka, IN New Delhi tomorrow (27.3.2015). TRAI has been undertaking various activities to outreach the telecom consumers to educate them and take feedback from them. The aim of the Authority is to create awareness among telecom consumers and other stakeholders about the various initiates taken by TRAI in recent times to protect the interest of telecom consumers. The programme will serve as an important interface between Telecom Service Providers, Consumer Advocacy Groups and telecom consumers. The Consumer Outreach Programme will be attended by the representatives of State Governments, all the Telecom Service Providers like Aircel, Airtel, BSNL, Idea, Reliance Communications, Vodafone etc., the Consumer Advocacy Groups and consumers. The spectrum auction in 1800 MHz, 900 MHz, 2100 MHz and 800 MHz band, which commenced on 4th March 2015 and ended on 25th March 2015 after 115 rounds over 19 days, has fetched over Rs 109874 Crore. In all 470.75 MHz has been put to auction in various LSAs. (in 800, 900, 1800 & 2100 MHz bands.) This compares with 390 MHz in Nov. 2012 and 426 MHz in February 2014. There was robust activity in the all the spectrum bands and vibrant bidding. Prices have significantly increased in 50 of the 69 offerings with bid price being as high as 300% over reserve price in some instances. Over 88% of the spectrum on offer has been provisionally committed at a value of over Rs 109874 Cr. Overall increases over estimated proceeds from auction is about 37%. In November 2012 the total realization from auction of spectrum in 1800 MHz band was Rs 9407 crore and in Feb 2014 Rs 61162 has been realized. A comparative table of the previous spectrum auctions is attached. The current auction indicates that the Telecom Industry has full faith in the Government of the day and is confident of the future growth of the telecom sector and the economy of the country due to growth oriented policies of the present government. This also shows that a transparent & fair bidding system can help realize the real value of the natural resource. Since the Supreme Court has given us the leave to proceed further, the provisional results are being declared. Of 8 participants in the auction, 7 have been awarded spectrum as per details attached. This is the first time that spectrum has been offered simultaneously in 4 bands. Previous auctions had conducted auction of different bands sequentially. This auction design has enabled bidders to take informed decisions while placing bids and consider alternatives dynamically. Another noteworthy feature is that for the first time there is robust demand for 800 MHz band which in previous auctions had seen very sluggish response. This spectrum auction also shows that natural resources have tremendous resources raising capacity provided government provides a level playing field and adopts a fair and transparent allocation policy coupled with growth and investment friendly regime. In such a scenario on the one hand private sector invests money to harness resources to earn profits and on the other hand it adds to the national economic growth and employment generation. The Department also took steps towards putting in place a roadmap for availability of spectrum by notifying the Defence Band and Defence Interest zone. A replica of the Bonus Debentures Certificate of Rs 7725.76 crore was presented here today to the Union Finance Minister Shri Arun Jaitley, by Shri Piyush Goyal, Minister of Power, Coal and New & Renewable Energy in the presence of Shri P.K.Sinha, Secretary, Department of Power, Government of India, Dr. Arup Roy Choudhury, CMD, NTPC, Shri K. Biswal, Director (Finance), NTPC, Shri I. J. Kapoor, Director (Commercial), NTPC, Shri U. P. Pani, Director (Human Resources), NTPC, Shri S.C. Pandey, Director (Projects), NTPC and Shri K. K. Sharma, Director (Operations), NTPC among others. The Government of India receives 618.06 crore bonus debentures amounting to Rs. 7725.76 crore by virtue of its 74.96% shareholding in NTPC. In addition to the bonus debentures, the Government of India has also received Rs. 2060.75 crore as dividend distribution tax on the debentures. NTPC Ltd. has earlier issued, by way of bonus, one fully paid-up, secured debenture of Rs. 12.50 each, for every one fully paid-up equity share of Rs. 10 each held by its members. The issue size of the bonus debenture is of Rs 10306.83 crore and is also the biggest issue of its kind in the Country and also the first ever by any PSU. The Bonus Debentures carries the Coupon Rate of 8.49% p.a. payable annually and has been allotted. The need for issuing bonus debentures was felt sometime in July / August 2014. As on 30th March 2014, the company had free reserves of over Rs. 72000 crores and a cash balance of Rs. 15300 crore. Since the Company is in regulated generation business, there is little room for improvement of profitability. High net worth of around Rs. 85000 crore depresses ROE which works out to only around 12.78% on reported basis. Thus there was a need for capital optimization. Since Company has entered in its 40th year of incorporation, there was no better way to reward the shareholders than issuing Bonus debentures. The transaction was executed in shortest possible time of 93 days from Board Approval to Allotment. As against 12-36 months by other issuers. Seamless co-ordination amongst Ministry of Power, Ministry of Corporate Affairs, Ministry of Finance and team NTPC. The debentures carry an attractive coupon of 8.49% fixed for entire tenure. The door-to-door maturity is 10 years – Debentures are redeemable in 8th, 9th and 10th year. Final release under National Small Savings Fund (NSSF) was made by the Union Government to various State Governments against collections made under Small Savings Schemes and amount received on redemption of special State/Central Government Securities. These releases are in the nature of investment of National Small Savings Fund (NSSF) in the Special State Government Securities. From the above amount, the Government of Punjab has been released an amount of Rs. 805.17 crore. After including this release, the total amount released against small savings collections to the Government of Punjab will be Rs. 2045.16 crore for the FY 2014-15. From the above amount, the Government of Andhra Pradesh has been released an amount of Rs. 549.60 crore. After including this release, total amount released against small savings collections to Government of Andhra Pradesh will be Rs. 1096.35 crore for the FY 2014-15. The Asian Development Bank (ADB) and the Government of India signed here today a $300 million loan agreement aimed at improving the road connectivity and increasing the domestic and regional trade along the North Bengal-North Eastern Region (NER). The loan is the first tranche under $500 million multi-tranche South Asian Sub-regional Economic Cooperation (SASEC) Road Connectivity Investment Program. Under this program, about 500 km of roads will be constructed. Shri Tarun Bajaj, Joint Secretary (Multilateral Institutions), Department of Economic Affairs, Ministry of Finance signed the Agreement on behalf of the Government of India while Ms. Teresa Kho, Country Director of ADB’s India Resident Mission signed the Loan Agreement on behalf of ADB. Speaking on the occasion, Shri Bajaj said that the project will improve road connectivity and efficiency of the international trade corridors by expanding roads in North Bengal and North-Eastern Region of the country. The investment on the ‘last mile’ connectivity will contribute to achieve the objective of regionally balanced and inclusive growth of remote and economically lagging regions, he added. Ms. Teresa Kho, Country Director of ADB’s India Resident Mission said that the improvements in road connectivity will enable efficient and safe transport within India and regionally with other SASEC member countries. The tranche 1 project will construct two national highways totaling about 150 km in West Bengal and State roads totaling about 180 km in Manipur, extending to Myanmar. The project is expected to be completed by December 31, 2021. ADB’s loan of $300 million makes-up nearly 71% of the total project cost of about $425 million, with the central and state governments providing counterpart finance of about $125 million. The loan has a 25-year repayment term, including a five-year grace period with an annual interest rate determined in accordance with ADB`s LIBOR-based lending facility. In terms of Section 90 of the Andhra Pradesh Reorganization Act, 2014, Union Government has decided to support Andhra Pradesh for setting up of SPV for the Polavaram Irrigation Project and release Rs. 250 crore in this financial year. The Union Minister of State for Home Affairs, Shri Kiren Rijiju has attended the Hans Raj College Alumni held at University of Delhi, here today. The Minister has inaugurated an Amphitheatre in the college premises. While addressing the Alumni, the Union Minister of State for Home Affairs expressed his happiness and said that coming to the college after several years is just like a homecoming. Inaugurating an Amphitheatre will provide ideal opportunity to students to express themselves freely and share and display their experiences, talent and creativity in theatre, music, dance, film, visual art, writing etc, he added. Consequent upon superannuation of Shri Rajan Gupta, IPS (PB:78), DG, BPR&D w.e.f. 31.3.2015, it has been decided with the approval of the Competent Authority that Shri R.R. Verma, IPS (BH:78), presently DG, NCRB will also hold the additional charge of the post of Director General, Bureau of Police Research & Development (BPR&D w.e.f. 01.04.2015 (F/N) till an incumbent to the post of Director General, BPR&D is appointed on regular basis, or till further orders. A group of 40 students from Massachusetts Institute of Technology (MIT), School of Management, Massachusetts, USA hailing from different parts of the world called on Union Minister of State (Independent Charge) for Development of North Eastern Region (DoNER), MoS PMO, Personnel, Public Grievances, Pensions, Atomic Energy and Space, Dr. Jitendra Singh, here today. The students are on an India itinerary, as a part of which, they undertook a trip to important offices and Ministries of the Government of India in New Delhi. In an interaction, the students engaged Dr. Jitendra Singh in a discussion on a variety of subjects ranging from India’s perspective and future road map particularly in the context of the Narendra Modi Government`s ten months rule. They also quizzed Dr. Jitendra Singh about the lesser known facets of his personal life and his journey from a medical professional, Diabetologist and author to an important Minister in the Modi Government. Giving a lucid account of India in the 21st century and Prime Minister, Shri Narendra Modi’s vision, Dr. Jitendra Singh said, India is on a fast track on the road to self-sufficiency and economic empowerment. Next few years, India is set to achieve its goals of becoming a world power, he added. When asked what were, possible hurdles in the path of India’s journey to progress, Dr. Jitendra Singh explained that India is a heterogeneous society with a huge population and several diversities living under same nationality. These factors are a distinguishing feature of India and though sometimes these may cause some disadvantage, in many ways these also offer an advantage and are a part of Indian civilizations cherished heritage, he observed. The students of MIT School of Management were inquisitive to know about India’s achievements in space technology, particularly the recent Mars Orbiter Mission (MOM). In reply, Dr. Jitendra Singh explained that the Mars Orbiter Mission was a 100% indigenous achievement and to that extent, it was the most striking example of Prime Minister Narendra Modi’s “Make in India” dream. He said, the Mars Orbiter Mission had given India a huge strategic advantage in the world arena and established India’s supremacy in the area of space technology. It is no small achievement that while 50% of Mars Missions since 1960 had proved a failure during the first attempt, it is the first Indian Interplanetary Mission to Mars which has created history by proving absolutely successful in its maiden attempt. Smt. Rashmi Mital, President, Railway Women’s Welfare Central Organisation (RWWCO) felicitated 35 railway women employees for their outstanding performance during 2014-15, at a function held in New Delhi. RWWCO honours the services of selected women employees of Group-C & Group-D for their outstanding services. The purpose was to boost up the morale of those women, who show exemplary dedication, integrity and courage in discharge of their duties and who also work quietly in any other social field viz. Hospital, School, Sports, Blood Donation, Family Welfare Programme, Scouts & Guides etc. The National Institute of Immunology (NII) today signed Memorandum of Understanding with various Delhi colleges for participation of its Scientists/ faculty in teaching of undergraduate students in these colleges under a programme titled as ‘Science Setu’. This followed a speech by the Prime Minister on the last Teachers` Day, wherein he had called upon Indian scientists to actively involve themselves in teaching in schools and colleges. Subsequently the Ministry of Science & Technology had sent a communication to the National Institute of Immunology (NII) through the Department of Biotechnology (DBT) on which the NII had taken a follow up action. NII held consultations with the teaching community of various colleges and as of now, Ten (10) Delhi University Colleges (Daulat Ram College, Dyal Singh College, Gargi College, Hansraj College, Hindu College, Miranda House, Ramjas College, SGTB Khalsa College, Sri Venkateswara College, Zakir Hussain Delhi Collge) agreed to be partners in the Science Setu programme. NII has formally signed MoUs with them today. More colleges are likely to be recruited. The programme generated a great deal of goodwill and excitement among the academic community, and will benefit both NII and the partner institutions. Under this programme, every permanent faculty member of NII is expected to spend at least 12 hours per year in an undergraduate college. NII intends to commence this programme w.e.f. the new semester starting from July 2015 or even earlier during the summer vacation at the colleges as per the needs of individual partners. A quiz was also organized for undergraduate students to mark the occassion and the winning and runners up teams were awarded prizes. Secretary, Department of Bio Technology, Dr K. VijayRaghvan, was the Chief Guest at the function. Professor Raghavendra Gadagkar, IISc, Bengaluru and President INSA, delivered a talk on the subject titled as- "Science Education Indisciplined". Apart from the faculty and the staff of NII, principals, teachers and students from the partner colleges to participated in significant numbers in the launch function of ‘Science Setu’. Minister of Shipping and Road Transport & Highway, Shri Nitin Gadkari has described the decisions taken by the Cabinet on March 25, 2015 regarding shipping sector as ‘revolutionary and historical’. While briefing the media persons on these decisions here today he said that the initiatives would make a very positive impact on the socio-economic situation of the country. The Union Cabinet took three important decisions in the Shipping sector. It gave its approval for enactment of Central legislation for declaring 101 additional Inland Waterways as National Waterways (NW) for navigation. In addition, the Union Cabinet gave its approval for formation of a Special Purpose Vehicle (SPV) to provide efficient rail evacuation systems to Major Ports and thereby enhance their handling capacity and efficiency. It also gave its ‘in-principle’ approval for the concept and institutional framework of Sagarmala Project. Carpet Export Promotion Council is organizing the 29th Edition of India Carpet Expo from 27th to 30th March 2015 in Hall No. 8 to 11, in Pragati Maidan, New Delhi under the aegis of Government of India. The Expo will be inaugurated at 11.00 am tomorrow, by Honourable Minister of State for Textiles (I/C), Shri. Santosh Kumar Gangwar in the august presence of Dr. Sanjay Kumar Panda, Secretary (Textiles) & Mr. Samir Kumar Biswas, Development Commissioner (Handicrafts). Other senior Government officials from the Central and State Governments and representatives from trade and media shall also be present. India Carpet Expo has received overwhelming response from the member exporters; 262 exhibitors are displaying their products in the show. Over the years, the Expo has established itself as a great sourcing platform for carpet buyers from all over the globe. Around 450 carpet importers from 57 countries mainly from Australia, Brazil, Canada, China, Chile, Germany, Mexico, Russia, Singapore, South Africa, Turkey, U.K., USA etc. have registered for the Expo. Buyers from first-time participants like Bulgaria, Israel, Malaysia, Mauritius, Taiwan, Zimbabwe, Vietnam, Serbia, Hungary are attending too. The Carpet Export Promotion Council is giving a subsidy of US $800 to buyers from USA, Canada, Australia, New Zealand, South Africa, Brazil, Chile and all other LAC (Latin American Countries) and US $550 to buyers from other countries towards air travel expenses. The Council is also providing complimentary hotel stay for the participants. Shri Kuldeep R. Wattal, Chairman, CEPC is confident that the Expo will generate good business and requests the media to extend their full support for promotion of this event and thereby facilitate handsome business for the participants. The newly elected Committee of Administration is taking all possible efforts for success of India Carpet Expo.